Madrid, Spain—Central obesity increases the risk for developing cancer in postmenopausal women more than high body mass index (BMI) and fat percentage, according to a study reported at the 2017 European Society for Medical Oncology Congress. “The findings put a new spin on weight management priorities for women in this age group, who are prone to abdominal weight gain. BMI and fat percentage may not be adequate measures of cancer risk,” said lead investigator Line Mærsk Staunstrup, MSc, PhD student, Department of Biomedical Sciences, University of Copenhagen, and Research Assistant, Nordic Bioscience A/S and ProScion, Herlev, Denmark. The Prospective Epidemiological Risk Factor study enrolled 5855 women from 1999 to 2001. Mean age at enrollment was 71 years. Medical history and demographic information were collected, and a dual x-ray absorptiometry scan was performed to measure bone mass, bone-free lean mass, and fat mass. Data were grouped according to breast and/or ovarian cancer, lung and/or gastrointestinal cancer, and other cancers. Cox proportional hazard regression models examined the association between body fat distribution and risk for cancer, adjusted for standard risk factors that included BMI. Among 811 solid cancers, 293 breast and/or ovarian, 345 lung and/or gastrointestinal, and 173 other cancers were identified. In the overall study, central obesity was a significant predictor of cancer diagnosis (P <.001). BMI and fat percentage were not associated with cancer risk. Analysis of the data in specific cancers found that central obesity was a significant risk factor for only lung and gastrointestinal cancer (P <.05). “This information is useful for elderly women, as the transition to menopause is accompanied by a shift in body fat toward the central trunk area. 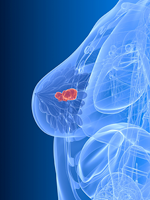 Clinicians can use this information in conversations with women who are at higher risk of cancer,” Ms Staunstrup said.